In this series, the biblical teaching on the kingdom of God has been surveyed from Genesis to Revelation in order to demonstrate that the whole counsel of God's Word conveys the idea that the kingdom is a yet future reality. In addition, this series has examined the isolated New Testament texts and miscellaneous arguments that "kingdom now" theologians typically rely upon and it has demonstrated how each is insufficient to convey "kingdom now" theology. As we move on to the final leg in our journey, we began noting why this trend of equating God's present work in the church with the Messianic kingdom is a matter believers should be concerned about, since this theology not only radically alters God's design for the church but is also the seedbed of many major false doctrines that have sadly entered Christ's church. Why does it matter whether Christ's present work through the church is equated with Christ's Messianic kingdom? The answer to this question lies in the fact that "kingdom now" theology alters the divine design for the church. Earlier in this series, we noted that the church, which began in Acts 2, exists for three specific, divinely-ordained reasons: to glorify God (Eph. 3:21), to edify the saints (Eph. 4:11-16), and to fulfill the Great Commission (Matt. 28:18-20). However, based upon a lengthy block quote given in the last installment, McClain explains how these basic and divinely-given ecclesiastical purposes rapidly become confused the moment that the church begins to view itself as the kingdom. When the church sees itself as the kingdom it typically seeks to grasp the reins of political power and rule by the sword. This philosophy represents a far cry from God's design for the church, which is to evangelize and disciple, or reach and teach, in fulfillment of the Great Commission (Matt. 28:18-20). While it remains appropriate for the church to positively influence fallen culture in some sense (Matt. 5:13-16), she is not called to rule and reign in the present age with kingdom authority. Instead, the church is to await the future, earthly, Messianic Kingdom when Christ will rule and reign with a rod of iron (Ps. 2:9; Rev. 12:5). Until that glorious future day arrives, the world will remain under Satan's influence (2 Cor. 4:4), and consequently the church will be living as a pilgrim in enemy territory. McClain's preceding quote notes at least three problems that emerge when the church sees itself as the kingdom and seeks to reign with kingdom authority in the present. First, the church ceases to see itself as a pilgrim in the world but rather sees herself at home in the world. A pilgrim is one who is simply passing through a temporary realm toward a final destination. In the same way, this world is not the church's home but rather is a temporary sphere that the church is passing through on her way to eternal glory. Chafer notes, "So the church was fully warned from the beginning about the nature of this age, and taught concerning her pilgrim character while here and her holy calling and separateness from the 'evil age.'" This theological reality explains why the New Testament often uses pilgrimage imagery to depict the church in the world (Jas. 1:1; 1 Pet. 1:1; 2:11; Heb. 11:13). It is interesting to note Social Gospel language in the writings of the "kingdom now" Emergent Church leaders. For example, Brian McLaren is clearly a kingdom now advocate. He argues, "If Revelation were a blueprint of the distant future, it would have been unintelligible to its original readers...In light of this, Revelation becomes a powerful book about the kingdom of God here and now, available to all" (italics added). Consequently, Brian McLaren laments, "The church has been preoccupied with the question, 'What happens to your soul after you die?' As if the reason for Jesus coming can be summed up in, 'Jesus is trying to get more souls into heaven as opposed to hell, after they die.' I just think a fair reading of the Gospels blows that out of the water." In other words, because the church sees itself as the kingdom, it would not consider the salvation of souls its top priority. Rather, it should instead also pursue a "holistic gospel" focused upon altering societal structures. Of course, this mindset does not represent the mission that God gave to the church. It only serves to distract her from her divine priorities and calling. Ryrie explains how such priorities can easily get out of order: “Holistic redemption can easily lead to placing unbalanced, if not wrong, priorities on political action, social agendas, and improving the structures of society.”  While ecclesiastical humanitarian effort is not wrong in and of itself, such efforts should always be used as a platform to proclaim the Gospel or practically demonstrate Christ-like love so as to gain a hearing to share the Gospel. If the Gospel becomes eclipsed by humanitarian concerns, then our priorities are grossly out of order. After all, what good does it really do in the eternal scheme of things to feed someone's stomach with a meal that only has a lasting impact of 24 hours, if he is never given the Gospel and consequently his soul goes into an eternal hell? Consequently, Social Gospel is also apparent in the work of "kingdom now" advocate Rick Warren. He calls his global mission strategy the "PEACE" plan. What did you not clearly hear about in this description of Warren's peace plan? There's absolutely nothing here about preaching the gospel. What an astounding omission this is, especially considering that the gospel is "the power of God for salvation to everyone who believes" (Rom. 1:16). There is also absolutely nothing here about fulfilling the Great Commission to "Go therefore and make disciples of all nations" (Matt. 28:19). There's nothing here either about Christ's final words to the church as recorded in Mark 16:15, where Jesus said, "Go into all the world and preach the gospel to all creation." Furthermore, there is no hint in any other Great Commission passage (John 20:21; Luke 24:46-48; Acts 1:8) to go and slay the five "global giants." Rather, the entire emphasis of these Great Commission texts is upon evangelism and discipleship. The Great Commission has largely become the "great omission" through the influence of Rick Warren and others. Kingdom building, societal transformation, and Social Gospel have largely replaced the church's central calling to evangelize and disciple. Thus, kingdom now theology should be avoided not only because it is not scripturally supported, but also because it alters the divine purpose for the church, thereby robbing her of divine power and blessing. Alva J. McClain, The Greatness of the Kingdom (Grand Rapids: Zondervan, 1959), 438-39. Hal Lindsey, The Road to Holocaust (New York: Bantam, 1990), 269. Craig Blaising, "Dispensationalism: The Search for Definition," in Dispensationalism, Israel, and the Church , ed. Craig Blaising and Darrell Bock (Grand Rapids: Zondervan, 1992), 14, n.3. Craig Blaising, "Theological and Ministerial Issues in Progressive Dispensationalism," in Progressive Dispensationalism , ed. Darrell Bock and Craig Blaising (Wheaton, IL: Victor, 1993), 288-89. For kingdom now quotes of Brian McLaren and other Emergent Church leaders, see part 1 of this series. Cited in Roger Oakland, Faith Undone (Silverton, OR: Lighthouse Trails, 2007), 203. Charles Ryrie, Dispensationalism (Chicago: Moody, 1995), 176. 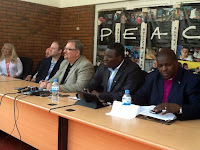 "Rick Warren and 1,700 Leaders Launch the Peace Coalition at Purpose Driven Summit," online: http://www.christiannewswire.com/news/249586720.html. Accessed 15 November 2014.